The right answer is only obvious in retrospect, as with this wonderfully-integrated and highly-contextual solution to a difficult problem: what does one make that neither adds to nor subtracts from the most famous house in American architectural history? 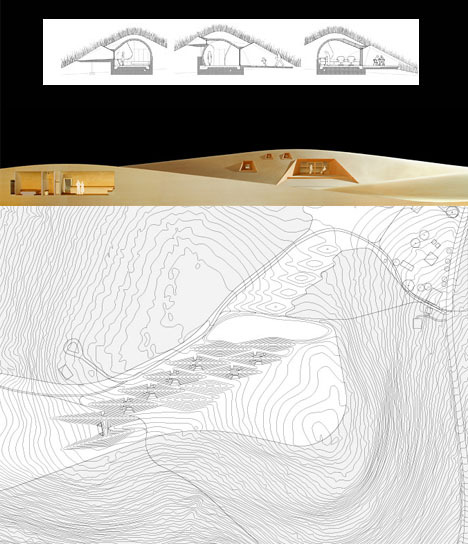 Frank Lloyd Wright’s own autobiographical words gave the winning group, Padkau Architects, the first hint: “No house should ever be on a hill or on anything …. It should be of the hill. Belonging to it. 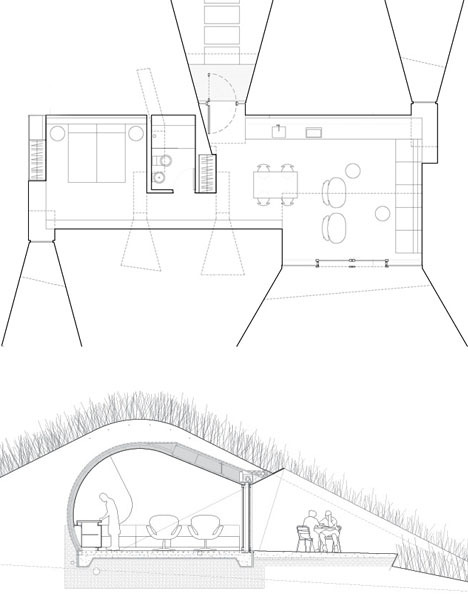 Hill and house should live together each the happier for the other.” An ethos of environmental integration pervades this project, from the mounding approach to the raw plywood-finished interiors. 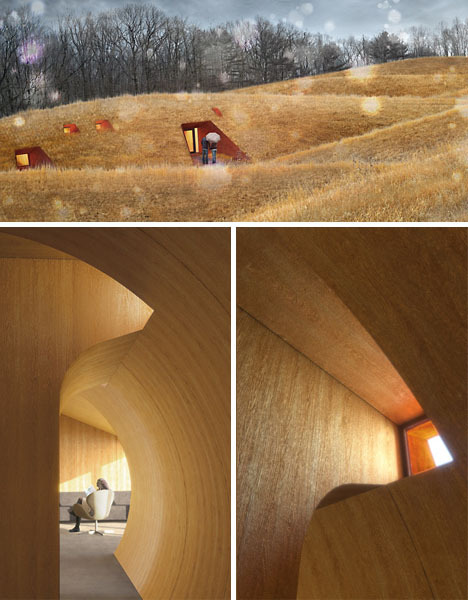 Another clue comes from the nature of the project – it had needed to be small and green, require few active systems and less electricity than a typical home, and ideally integrating natural heating and cooling techniques. Really, that left only one way to go: down. Note that the presentation panels are simple and clean, very Wright-like as well – nothing to distract from the core idea. 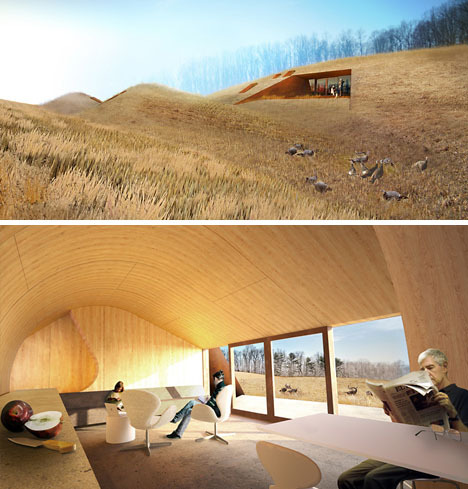 The underground homes proposed are tucked into grassy mounds, blending in with the surrounding landscape and providing minimalist shelters for visiting artists-in-residence, architects and educators. 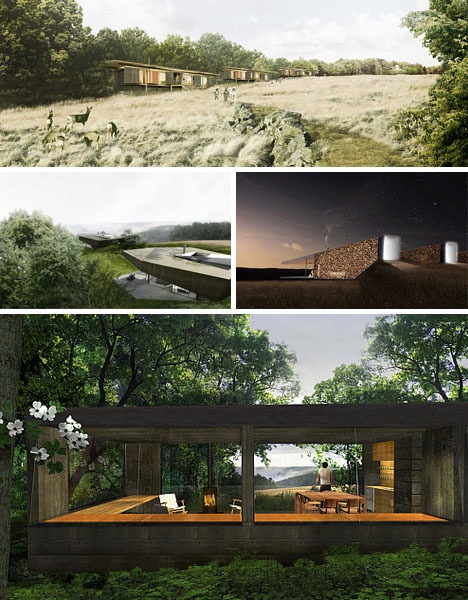 The jurors saw this competition entry as the ideal solution – a small-footprint way to accommodate basic needs, respect Wright’s attitude toward context and avoid stepping on his proverbial toes. Other submissions, it would seem, fell short because they went too far – anything that stuck out too much physically (or stylistically, for that matter) would compete (no pun intended) too much with the original work, which stands proud and tall but also shoots out horizontally to embrace the forest around and waterfall below it. More than ever, many architects are employed or underemployed in any conventional sense – jobs are one answer, of course, but competitions provide another way into the field for others.